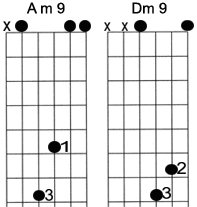 A nice pair of minor 9 chords using open strings to give a good ringing sound excellent for fingerpicking which is what I have played here. This is a three finger pick - finger 3 gets the top string - finger 2 gets the second string and finger 1 gets the third. The thumb gets the bass notes. If you're not up for picking you can strum these or use one of them as a crash chord.